Arsenal are not planning to sign another striker to replace Olivier Giroud - even if scans on his ankle confirm a serious injury. The club have no intention of recruiting any forwards on a permanent deal in this summer's transfer window. Gunners manager Arsene Wenger will assess the loan market. The Frenchman plans to stick with his existing options of Alexis Sanchez, Joel Campbell, Yaya Sanogo, Lukas Podolski and Theo Walcott. France striker Giroud, 27, was due to see a specialist to assess the extent of the injury, picked up in the Saturday's 2-2 draw at Everton. There are fears he has broken his ankle and that he could be ruled out for up to three months. An update on the results of a second scan - carried out after the swelling had gone down - is likely to come after Wednesday's Champions League play-off second leg against Besiktas. 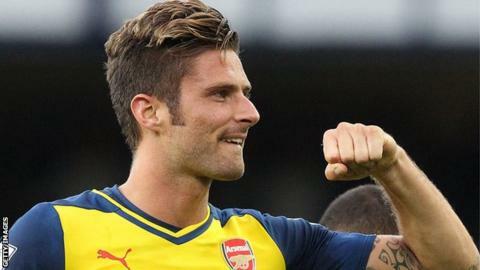 Giroud came off the bench to score the Gunners' equaliser in the 90th minute at Goodison Park but picked up the injury in the closing seconds of the game. Arsenal still hope to sign another versatile centre-back or holding midfielder who can potentially perform both roles - as back-up for what they already have available to them.